Yesterday afternoon I used a camera-phone to record some examples of dangerous and illegal driving outside a local primary local school. These included a car arriving at speed and stopping with two wheels on the pavement in the ‘school zone’ and also a driver reversing into a parking spot by yellow lines opposite the school zone. Before I was able to capture more examples of dubious parking the second driver drove up, stopped his car in the middle of the road and then got out and pushed me backwards and asked me if I was a pervert! As in happened, there were two off-duty police officers collecting children from school and I ended up having a useful discussion with these policemen and the assistant head of the school about this incident and wider issues. The Policemen were unambiguously supportive of the campaign aims but suggested that the approach taken wasn’t ideal. Given my recent experience and regular reports of violence outside schools elsewhere I had to agree with them! Indeed the assistant head said that there had already been four confrontations outside the school between parents. He said that he wanted to talk with the head about what would be appropriate way of proceeding. The reason for this post however is not to tell that story, but to highlight a pattern. Two previous drivers, both driving black Range Rovers as it happens, had accused me of being a ‘nonce’, ie a pervert. Here is one of one of them parked in the middle of the carriageway in a pedestrian-only zone waiting for someone to return. He had decided that I had taken a picture of a small child who he assured me was buried somewhere inside the huge vehicle hidden behind the smoked glass! 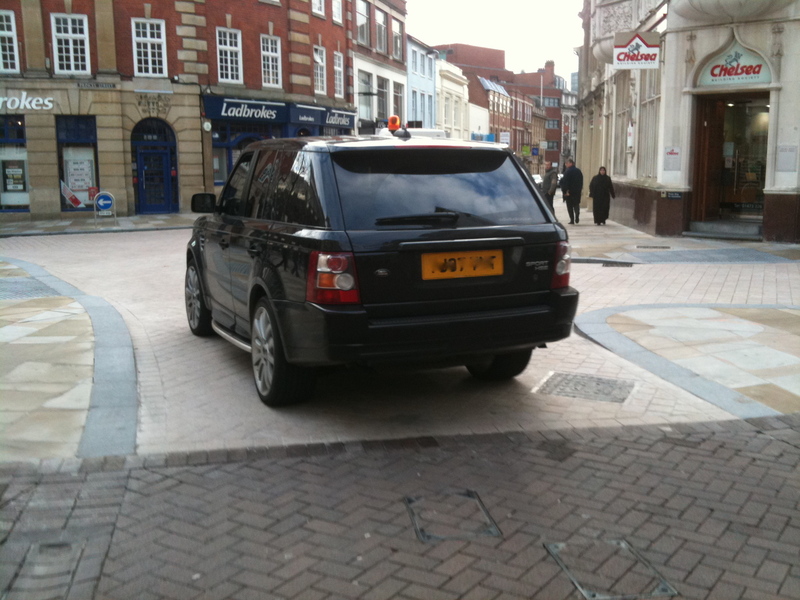 The other occasion was when I had spotted another Range Rover, this time one which was parked on the pavement outside a local shop on double yellow line. I said nothing but then found the vehicle kerb-crawling me as I walked on. The driver asked me what I had been looking at, and then asked if I was some sort of pervert. I found this odd given that he was the one behaving unusually and threateningly but it wasn’t really about logic but about power. 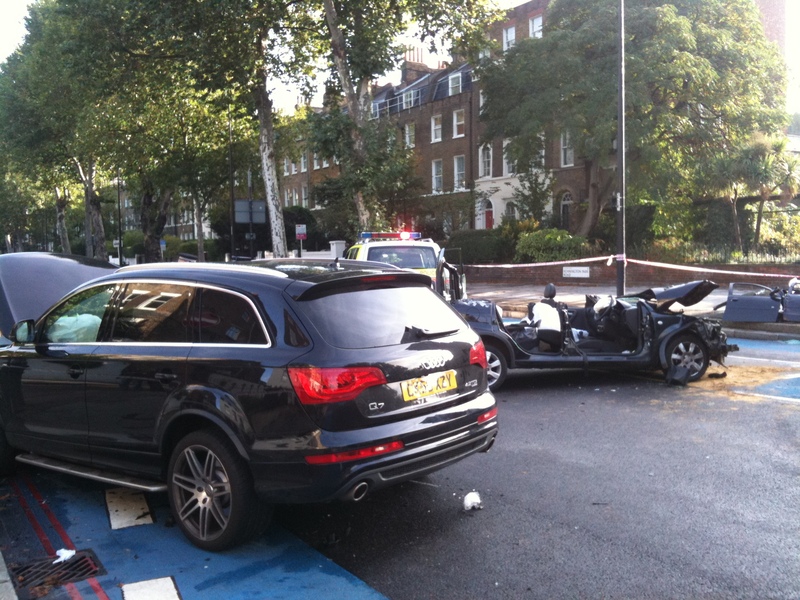 Finally, I was cycling on one of the new London ‘Cycle Superhighways’ near the Oval and came across this incident. Why are vehicles as large as the one on the left allowed on our city streets at all? This Audi Q7 weighs 2.2 tonnes, has a minimum engine size of 4.2 litres and scores 2 only out of four for pedestrian safety. Clearly smaller cars don’t come off very well in an collision either. Incidentally the £43,000 Range Rover scored a ‘dire’ 1 out of 4 for pedestrian safety in 2002. Here are the official results which include the comment ‘Just three sites out of 18 tested on the vehicle’s front gave any protection. This is dire, and Land Rover needs to improve matters’. My conclusion from the above is that the type of motorist who ignores all the social conventions and regulations around what sort of vehicle to drive and how and where to park will also be a self-selected group of ‘Motorists’ (as in die-hard capital ‘M’ Motorists) who are likely to behave unpredictably and dangerously when challenged. Any campaign of this sort needs to be aware of that. As for the pervert claim, I see that as just one of a number of excuses and distractions by drivers for not address the issue at hand. For sure society needs to be vigilant in relation to child abuse but not at the expense of the huge risk to the safety and freedom of children from the drivers who behave illegally, carelessly or recklessly outside schools every day. That being said the use of camera-phones outside schools, particularly video-recording is unwise in the current climate even though it is the only way to gather credible evidence of driving on the footway or of careless driving. walking round taking photos seems to create more conflict than cycling round; some places like outsiders less than others -like Portsmouth. On-bike or on-helmet cameras, or the equivalent for walking (those veho muvi’s clip to rucksack straps) are more subtle.